Prices on this page are subject to change without notice. The Hallelujah Diet promotes drinking distilled water to aid the body in removing toxic substances from our bodies. Distilled water is the world's best solvent, removing inorganic minerals and toxic chemicals that have accumulated over the years of eating the Standard American Diet (SAD). It also is best at hydrating cells and providing the body with vital fluids necessary for good health. Eliminates the inconvenience and expense of buying bottled water. No more trips to the store or heavy bottles to carry home at a fraction of the cost. Water Distillers let you bottle your own water right in your home. 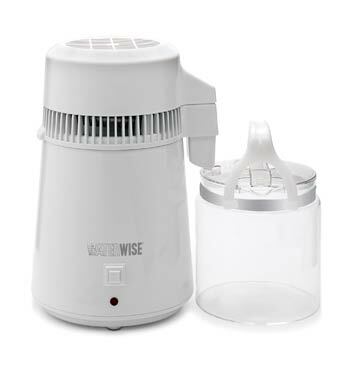 Increases the life of water using appliances such as coffee makers, steam irons and humidifiers preventing mineral build up. Goes to work around the house on special jobs like watering plants, clearing contact lenses, photo processing and filling batteries. Waterwise Distillers use the most effective method of water purification : distillation. Water is boiled, killing bacteria and viruses, then vaporized to separate out minerals, lead, bacteria, nitrates and other contaminants. The vapor is then condensed back into liquid form that is 99.9 percent pure . Distillers eliminate the cost and inconvenience of buying bottled water, and help maximize the life of water-using appliances such as coffee makers, steam irons and humidifiers by preventing mineral build-up. 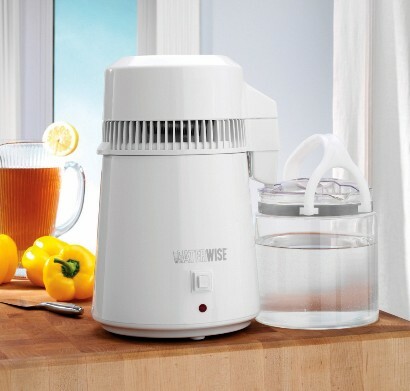 Our compact countertop distiller produces a 1 gallon batch of clean, pure water in just 4 hours! Providing enough water for up to 4 people, the 4000 requires no assembly or installation and is as easy to use as a coffee maker. Simplicity by design makes the 4000 simple in operation! 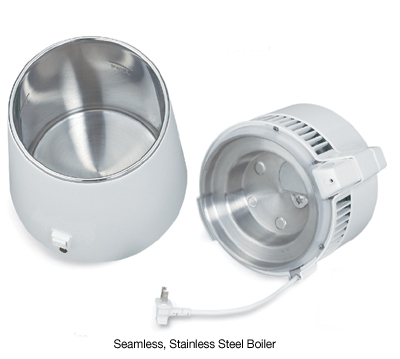 Just fill the stainless steel boiler with ordinary tap water and plug into any standard electrical outlet. Then push the start button and walk away. The 4000 stops automatically when the cycle is complete. With its clean lines, powder-white finish and space saving size, the Waterwise 4000 will complement any kitchen decor. The Distiller 4000 comes with a 1 gallon Polycarbonate collector/storage bottle which fits easily inside your refrigerator. For travel convenience, the bottle goes inside the distiller! This unique portable design is ideal for RVs, campers, mobile homes and dorm rooms. 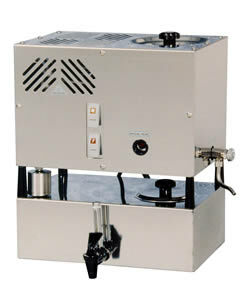 The 4000 is available for all worldwide electrical requirements and includes a detachable power cord. 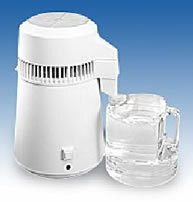 Compact dimensions: Height ­ 15", Diameter ­ 9"
After 1-2 months spout filters should be replaced. See below for ordering & payment options. Boiling chamber should be cleaned as needed with distiller cleaner. eg. Citric Acid, available at chemists. Shipping estimates available on request. Alternatively international postage invoice will be e-mailed once order has come in. Please note - The Polar Bear Distiller company has been taken over by Precision water distillers. 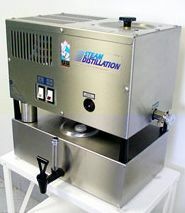 So we now supply Precision Commercial Water distiller that are very similar or equivalent to discontinued Polar Bear models. All Polar Bear Water Distillers are constructed of high grade polished stainless steel. Built to last a life time, there is a ten-year warranty on stainless steel components. Low density incaloy sheathed heating element: Lasts longer due to extra length of elements which dissipates the heat over a larger surface. The incaloy sheath protects against corrosive chemicals in the water. Charcoal Filter: After the steam is condensed by fan cooling, the distilled water produced then passes through a granulated coconut charcoal filter. This aerates the water, giving it a "fresh" taste and traps any volatile gases that may have escaped in the distilling process. 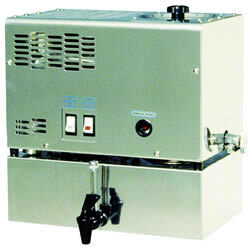 Polar Bear distillers have a refillable stainless steel filter canister between the distiller and the holding tank. Standard automatic start/stop float system prevents the boiling tank from boiling dry and extends the life of the heating element. Distilling Capacity 3.8 Litre / 3 hrs. 1) & 3) The PWS 8-M and PWS 8-5 have 30.0 L per day approx. capacity (more than the PB 26 M @ 22.8L / 24 hrs). 1) The optional holding tank for the PWS 8-M is similar at 11 L.
3) The PWS 8-5 holding tank is slightly larger than the PB 26 M model ie. 15.2L (not 10.5L as in the 26 M). 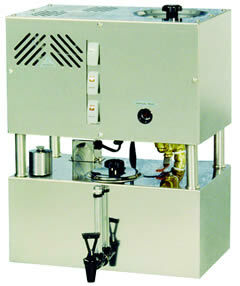 Current price for the PWS 8-M is £995.00* including VAT @ 20% with delivery within mainland UK. 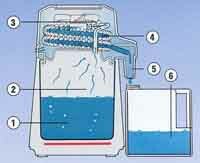 Commercial Water Distillers - Commercial & Industrial Use Water Distillers - for Factories, Offices, Laboratories, etc. Distilled Bottled Water - Bottled on Demand - Bottled on demand at 0ppm, delivered to your door. Custom / Own labels available. Magnetic Pad. You can use this powerful magnet to put directly on to aches and pains as it comes supplied with its own velcro strap. It eases aches and pains but will also speed up the healing in the area of application.The Magnetic Pad can also be used to magnetise water. Aqua Balls & Replacement Pellets: Each Aqua ball lasts over 60 washes, you get two balls and two sets of replacement pellets. This amounts to about 6p a wash. Save over 75% off your laundry bill and help save the environment.